Recreational immunity encourages landowners to open their private property to the public for recreational use. It protects the landowner if a recreational user seeks damages after an injury. The immunity in Washington, Oregon, Idaho and Montana generally applies regardless of whether the user is invited by the landowner. Depending on the state, the landowner’s obligations before the incident are nominal, such as posting signs or charging mall fees. However, because the landowner’s responsibilities vary by state, this article summarizes the significant aspects of each state’s laws. This article does not provide legal advice. The facts and law of any specific incident must be analyzed before relying on the contents of this article. Traditionally, a landowner’s responsibility to a user of his property depended on whether the person was invited, was licensed or trespassed. States have chosen, to varying degrees, to modify this responsibility (to keep the premises in a reasonably safe condition, including a duty to inspect the premises and discover dangerous conditions) to encourage landowners to open their lands to the public for recreational use. The similarities and differences of each state are summarized in Table 1. Similarities among states. 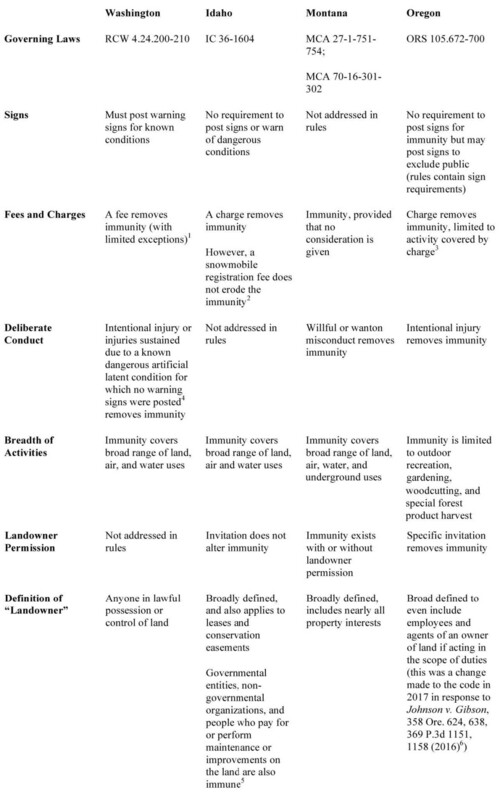 First, while all four states provide recreational immunity, the immunity is removed when the landowner charges a fee. However, as discussed below, the states have carved out varying exceptions to the definition of “fee” or set dollar limits that eliminate the immunity. Second, although the specific legal standard varies, in all the states but Idaho, deliberate action by the landowner removes the immunity. Creating a hidden danger, such as laying a trip wire across a trail, would be a deliberate action. Incidental injury arising from an intentional activity is not deliberate.B Idaho is silent on this provision in the immunity law. Third, the definition of “landowners” also varies by state, although it is broadly defined to include nearly all types of property interest, such as tenants and easement holders. Differences among states. The states’ approaches to what constitutes a fee that removes immunity varies. For example, in Washington, a landowner may charge up to $25 for firewood and still be covered by the immunity, while in Oregon, she may charge $75 for a cord and $15 to park and still have immunity. If the Washington landowner charged $26 or the Oregon landowner charged $76, they would lose their immunity. However, the Oregon landowner would only lose it for the firewood cutting; she would maintain it for any other recreational activity by the user on her property. Another difference between the states depends on whether the user requests permission for the use. Oregon removes immunity if a user requests permission from the landowner and it is granted. The traditional common law of assumption of risk applies, where recreational immunity is absent. Montana and Idaho’s immunity exists with or without permission of the landowner, and Washington’s rules do not discuss permission since all recreational users are treated equally. Obligations to post signs also vary by state. In Washington, a landowner must post a sign warning of known dangerous conditions, while in Oregon, signs must be posted to exclude the public. The Oregon laws contain recommended language and other requirements for the signs in ORS §105.700(2) at: oregonlaws.org/ors/105.700. Montana is silent on signs, while Idaho states that a landowner has no obligation to put up signs or maintain them. Notably, in Idaho, the user is liable if she damages the property, livestock, or crops while recreating on the property, and in Oregon, the user may have to pay liquidated damages if she ignores a sign that specifies the property is closed to the public. Further, what constitutes “recreational activity” varies by state. Each state’s laws define a non-exclusive list of activities. All the states include hiking, biking, scenic viewing and other relatively low-impact activities. Washington also includes many types of airborne activities and rock climbing, while Montana’s list reflects its more rural nature including dude ranching and target shooting. In Idaho, any type of animal riding is covered, while in Oregon activities covered also include volunteer work and hunting. No legal overview is complete without a hypothetical. To demonstrate the difference of the application in the states’ laws, we will consider a hypothetical scenario where Nelly Neighbor wants to come onto Larry Landowner’s property to cut some firewood. Beginning with Washington, if Larry Landowner allows Nelly Neighbor to cut firewood, and charges her $20, Larry Landowner has recreational immunity. If Larry instead charges Nelly $30, he loses his immunity. If Nelly trips over a root and breaks her leg on her way to cut firewood, Larry (when he charged only $20) has immunity. If Larry does not place a conspicuous warning sign for future firewood cutters, he loses his immunity if another neighbor trips over that same root and breaks her leg also. In Oregon, if a member of the public comes onto Larry Landowner’s land, trips over a root and breaks her leg, Larry has immunity. However, if Larry invites Nelly Neighbor to cut some firewood, and Nelly trips over a root and breaks her leg, Larry does not have immunity. If Larry charges $80 to cut a cord of firewood, he loses his immunity for any injury caused by cutting firewood. If, however, Nelly paid $75 to cut a cord of firewood but, once she got onto the property, tripped over the root while chasing an owl to see if it was spotted or barred, Larry still has immunity. If Nelly ran past Larry’s sign that said “Closed to Entry” in hot pursuit of the owl, she may have to pay up to $1,000 in liquidated damages to Larry. In Montana, firewood cutting is not defined as a recreational activity. Like our unfortunate Washington and Oregon cutters, Nelly Neighbor trips and breaks her leg, but here, the recreational immunity law doesn’t apply. Presumably, the law of assumption of risk would continue to apply. If, however, Nelly brings her sled and headlamp onto Larry Landowner’s property, intending to get downslope, do some spelunking, and as an afterthought, grab some firewood to warm up with that night, Larry has immunity for the broken leg Nelly gets when her sled careens out of control into the cave entrance. damages to his potato field caused by her runaway mule. The Washington Supreme Court recently affirmed the expansive breadth of Washington’s recreational immunity statute in Lockner v. Pierce County. Ms. Lockner was riding a bicycle with her niece on a popular recreational and commuter bicycle pathway owned by the county in the Orting Valley. At the time, a county employee was mowing grass adjacent to the pathway. As Ms. Lockner passed the lawnmower, it ejected a puff of dust or smoke, causing Ms. Lockner to lose control of her bicycle and resulting in injuries. A prior decision suggested that the property cannot be used for any purpose but recreation to obtain immunity. The Court in Lockner clarified that the statute is not so limited. The Court stated that the land may be used for any number of private or public purposes, including recreational use. This decision makes good public policy sense for the landowner, since privately held lands are often multi-functional to the landowner and the public. Absent legislative change, Washington courts are clearly not interested in limiting the breadth of Washington’s recreational immunity statute. Recreational immunity conflicts arise more often for wheeled recreational uses (mountain biking and off-road vehicles) because many other recreational opportunities exist for hikers, bird watchers and horseback riders on federal and local government lands. Recreational immunity provides a nearly insurmountable hurdle for an injured user to obtain damages from the landowner—provided that the landowner does not charge a fee. Recreational groups recognize this benefit to the landowner, so they seek out collaborative relationships with willing private landowners that allow the users to develop their preferred uses on private land, such as mountain biking trails. Much like hunters will self-police poaching, a well-organized and funded recreational group can provide benefits to the landowner. First, a user group polices the area, so the landowner can expend less effort enforcing his private property rights. Many recreational groups also reduce other trespassers, such as those engaged in illegal dumping, by their presence. Second, groups with resources not only design usable trails, they maintain those trails, reducing erosion and impacts from unmonitored illegal trails. given to private landowners through recreational immunity laws. Consult with an experienced attorney for information about application of your state’s laws to your situation. AThis article was originally authored by Martha Wehling and published in 2013. She graciously offered the undersigned the opportunity to update her article to reflect changes since last publication. She deserves credit for the foundation on which this current version substantially relies. I also want to thank Kyler Danielson of Schwabe, Williamson, & Wyatt for her time, energy, and dedication to researching the specific statutes referenced herein. BLockner v. Pierce County, 415 P.3d 246, slip op. 94643-4 (April 19, 2018). In Lockner, a bicyclist was injured when a puff of dust or smoke was discharged by a lawnmower. The employee was intentionally mowing the grass but did not intentionally cause the puff or dust or smoke to injure the bicyclist. 1“To maintain recreational use immunity and charge a fee, ‘[a] landowner must only show that it charges no fee for using the land or water area where the injury occurred.’ A landowner is not entitled to immunity when the place where the injury occurred is a ‘necessary and integral part’ of the fee-generating area.” Hively v. Port of Skamania County, 193 Wn. App. 11, 15-16, 372 P.3d 781 (2016) (citing Plano v. City of Renton, 103 Wn. App. 910, 915, 14 P.3d 871 (2000). 2Albertson v. Fremont Cnty., Idaho, 834 F. Supp. 2d 1117, 1131 (D. Idaho 2011). See also Hayes v. City of Plummer, 159 Idaho 168, 171, 357 P.3d 1276, 1279, 2015 Ida. LEXIS 259, *9. 3A fee charged at one end of the Deschutes National Forest cannot, as a matter of public policy, waive immunity at the other end of the same forest, simply because the government made a charge. Stringer v. United States Dep’t. of Agric. (Forest Serv. ), 63 F. Supp. 3d 1269, 1273 (D.C. Or. 2014), citing Hannon v. United States, 801 F. Supp. 323, 327 (E.D. Cal. 1992). 4Davis v. State, 144 Wn.2d 612, 616, 30 P.3d 460 (2001). 5This section of the statute was added in March 2018 and will go into effect on July 1, 2018. 6Johnson found that individual employees who are responsible for repairing, maintaining, and operating improvements on city-owned recreational land made available to the public for recreational purposes are not “owner[s]” and are not immune from liability for their negligence. Column first appeared in the Summer 2018 issue of Northwest Woodlands Magazine.